OpenGL 2.0, PowerVR SGX Kern, Screen Tiling, Internal True Color Processing,Zero overhead AA, 32 Bit floating-point operations. 2)Install the files from Windows Device Manager. Read Official Guide IEMGD add-on for more infos. N.B.It doesn't work with GMA600 due to the different platform! Can be incompatible with some device because some display has different configurations. Auto Configuration works on: Acer AO751H -Asus 1101HA - Asus 1201HA -Archos 9 PC Tablet - Dell Mini 1010 - Kohjinsha SX3 -MSI U115 - Nokia Booklet 3G-Viliv S5, Sony Vaio P VGN-P720K , Sony VGN-P29VN_Q, ect ect. Got black screen with IEMGD or Strange colors view? This mean that common settings are not compatible. If you are not good at computer simple check on Google for another custom package (Googling: EMGD for YOURDEVICE) than share with us that driver! ITA.In alcuni pc il driver non funziona correttamente (windows si avvia con schermo nero,colori psichedelici o schermo tremante). Questo problema è causato dal file igdlh32.inf . Normalmente, il driver richiede le informazioni specifiche all'hardware ma se l'EDID (Extended Display Identification Data) non è completo (poco importa se la marca del pc asus,acer o altro questo parametro dipende dal display che durante la produzione è stato inserito) vengono utilizzati i settaggi alternativi presenti che non possono garantire il funzionamento corretto su tutti i monitor. 1)cercate su Google, o altro motore di ricerca, un driver IEMGD compatibile per il vostro device. In giro ci sono molti Publisher e se volete condividete con noi il file igdlh32.inf contenuto nella cartella LPCO. 2)Sviluppate una configurazione funzionante tramite Intel CED o tramite IEMGD Add-On. Come si fa? Scaricate AIDA64,leggete l'ID del monitor e poi cercate su Internet il datasheet del pannello. All'interno del file digitale troverete tutte le informazioni richieste. WinXP\Vista\7 driver respects XPDM (XP Driver model),supports DXVA 1.0 (DirectX Video Acceleration) and has a better software rendering while Win7\8\8.1\10 ,WDDM 1.1,driver has full support to DVXA 2.0 and a better hardware rendering(reduce CPU usage). Under Win 7, usually, is better to use a WDDM driver. Intel Embedded Media & Graphics Driver has more apps\games compatibility, bugfixes, OpenGL 2.0 support and it is directly setted for highest performace (about +20% vs stock driver). Small fixes were added to make it: light,stable with US15 Platform.Furthermore my Win 7/8/10 custom package includes: the WDDM (Windows Display Driver Model) 1.1 driver; IEMGD Add-On, a fast way to generate custom profiles; multidevices support; AutoSupport for Windows 8/8.1/10; Fixes/workaround for minor bugs like incompatible MS Performance Test, unworking Attribute button, Display detection, Brightness Level Control; a fixed uninstaller,remove all exept OpenGL that will be always enabled, also if you downgrade to official intel driver. IEMGD doesn't support downscaling (ex. allows to set 1024x600@1024x768), DPST (Display Power Savings Technology Policy available only when on Battery), ALS(ADB = Automatic Display Brightness Policy available only when on battery in devices with ambient light sensor). Anyway there is no significant battery usage. Compiled to work with more devices without download an heavy suite,reduced package size and fixed some problem(really more easy to install it). Which is the best O.S. for Intel GMA 500? Which is the latest DirectX available for Intel GMA 500? Hardware support it until DX9c or DX9L but you may install newer package for bugfixes. Is possible to play 1080p video with Intel GMA 500? Yes, it is possible with correct video player (see this post) and correct video codec. Is necessary vBios for install this driver? No, it isn't. The Driver works correctly also without Embedded vBios (Beta). Embedded Video Bios isn't compatible with Intel Official GMA 500 Driver and doesn't bring any benifit. This operation is not suggested on laptop. What is Mesa3D - Wrapper Package? How to install the MESA3D OpenGL Software Accelerated: This solution is suggested only on Windows 8.x and 10 because the OS doesn't support Hardware OpenGL rendering. Anyway this method has a slow rendering but you will able you to run applications that require OpenGL > 1.1 (Stock Windows). Download Optimus IEMGD (this method will not require any modification to your system) or download Mesa3D - Wrappers Package. -Unrar it, rename Mesa3D opengl32.dll and overwrite igdogl32.dll in c:\windows\system32 folder. Note.When your app requires only max OpenGl 1.1 rename c:\windows\system32\igdogl32.dll to, for ex, igdogl32disable.dll,or use Optimus IEMGD option, because Microsoft stock opengl has better performance. Why Intel GMA 500 is so slow in 3D Graphic? It is a little bit complicated to say but essentially for GPU low clock,architecture and not perfect Intel driver. This kind of platform was develop as MID (Mobile Internet Device): Internet and Media that is exactly what our devices do! 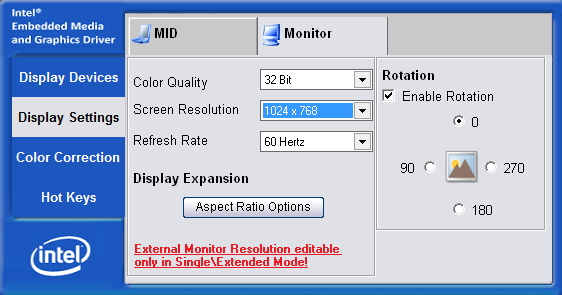 Extended Desktop = Each Monitor shows an Image (can be the same if you copy it in extended desktop) and have a proper editable Resolution and Refresh Rate. Usually this operation is not required by default. MS Windows includes displays tools but take really more time and the results are not so different from stock configuration. Anyway for "normal" users, that want to try this feature, I suggest to use Intel Tool Utility. 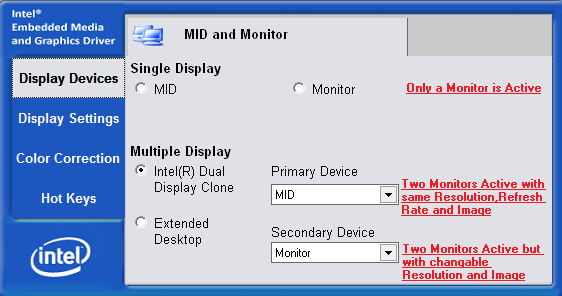 Values are display linked so it's impossible to know which is the best configuration for your monitor. THANKS TO TESTERS! Custom Support is ENDED (no more upgrades). If you are getting problems with lastest revision, write a comment, try old builds or google for another custom driver and share with us your working configuration. Hello, excellent blog! Which linux distro do you recommend for gma500, asus eeepc 1201ha. Need the best driver for youtube. thanks!! Ciao ho testato il tuo driver su windows 10, funziona molto bene ottimo lavoro. Però ora mi sono imbattuto ad installare sul mio ASUS Eeepc 1101HA windows 2000. Tutti i driver sono funzionanti, l'unico che non ho è quello della scheda grafica. Sapresti consigliarmi un driver per questo computer tu che sei più esperto di me? hello, sorry, what is the driver that I must install to have the highest speed in windows 7 home premium? I'm confused. Thank you very much already! for gaming depends: opengl wddm, dx probably is better to bypass gpu with xppd (Xp driver rev2014). in general wddm driver is better to support gpu hw rendering.